It’s well known that many freshwater mussel species in North America depend on fish for survival. Their glochidia, or larvae, attach temporarily to fish before dropping off to develop into juvenile mussels. But a discovery by Department of Natural Resources and University of Georgia scientists hints that at least for American shad on the Atlantic Coast, that fish-mussel relationship may work both ways. DNR zoologist Jason Wisniewski was collecting gravid mussels on the Altamaha River in February 2009 when he opened a live mussel to find what looked like a BB-sized pearl. Yet, this pearl was rubbery. Other mussels had the same. Fellow zoologist Brett Albanese suggested they appeared to be fish eggs. Early last year, Wisniewski and a group including DNR technicians Matt Hill and Deb Weiler returned to the Georgia river to search for mussels with eggs. Their goal: Determine the egg species and whether the 2009 find was coincidence or something that could be documented throughout the basin. Their surprising results: 6 percent of nearly 760 native mussels sampled from seven sites across more than 150 miles contained one or more eggs. Embryos were moving in many. Molecular analysis at UGA’s Department of Genetics identified all of the eggs as American shad, an anadromous herring valued for sport and commercial fisheries, and a species of conservation concern because of declining numbers. Although some fishes native to Africa, Asia and Europe use mussels in breeding (video of bitterlings spawning in mussels), these Altamaha “pearls” marked the first time on this continent that native fish eggs had been documented in live mussels. If further research affirms a mussel-shad bond that helps one side or both, that relationship could boost and blend efforts to conserve each. The profile of lowly mussels would be raised: They not only filter pollutants and indicate clean water, they may also serve as a link in the life of high-profile fish. For American shad, more mussels could translate into a more robust fishery. “I think it really shows how everything’s connected,” Wisniewski said. What's needed next? Determine if the relationship is amensalistic (negatively effecting one species), mutualistic (benefiting both) or commensalistic (benefiting one without harming the other). That includes studying survival rates of shad eggs in mussels – and just how or where do the young fish escape? Also, can scientists find shad or other fish eggs in live native mussels in other Atlantic Coast rivers? The research that raises those questions appears in the upcoming issue of “Transactions of the American Fisheries Society” in an article co-authored by Wisniewski, Hill, Katherine Bockrath and Dr. John Wares of UGA’s Genetics Department, and Andrea Fritts of the Warnell School of Forestry and Natural Resources. The project was funded in part through The Environmental Resources Network, or TERN, friends group of the Nongame Conservation Section. American shad swim far upstream to spawn in natal rivers, from the St. Johns in Florida to the Sand Hill in Labrador. Males fertilize eggs that are broadcast by females and then float downstream before sinking to the substrate. The eggs found in the Altamaha mussels likely arrived by “passive transport” – they floated, rolled or bounced in through incurrent apertures or between gaping valves. Flow and dissolved oxygen levels in the mussels is probably suitable for the developing eggs. Fish hatched in mussels in Europe, Asia and Africa are able to escape, indicating that is possible here. Researchers speculate that eggs sheltered in mussels might have a higher survival rate. In the Coastal Plain, which has dense mussel populations and mainly sand substrates that are less suitable for fish eggs developing, mussels could substitute as substrate for American shad and other fishes. Most eggs found – 31 – were in Altamaha slabshells, one of the largest and most common mussels in the Altamaha basin. Ever wondered what’s making that peep or croak or, yes, even that retching noise near your house? Produced by DNR’s Nongame Conservation Section with a grant from the nongame friends group TERN, “Calls of the Wild” explores the fascinating sounds and life histories of the 32 frog and toad species found in Georgia. First released in 2003, the CD has been revised to include the discovery in coastal Georgia of invasive Cuban treefrogs. An accompanying booklet of species profiles has been expanded with color photographs, new range maps and more details. The additions build on the narratives and recorded calls that offer insight into native and non-native frogs in the state. There’s also more than 20 minutes of mixed-species choruses that can serve as soothing natural background music or a stiff test of your frog ID skills. Ditto for the eastern spadefoot toads, the source of that retching sound that caught your ear. Copies of “Calls of the Wild” retail for $14.84. The breakdown is $11.45 for the CD, $.80 in sales tax (Georgia residents only!) and $2.59 for shipping and handling. Complete and mail this order form. For wholesale orders, or credit card orders by phone, please call (478) 994-1438. Proceeds go to the Wildlife Conservation Fund, which supports the Nongame Conservation Section’s work to conserve rare and other Georgia nongame wildlife, plus native plants and natural habitats. From green treefrogs to bullfrogs, nearly all “Calls of the Wild” recordings were made by frog expert Walter Knapp. Terry W. Johnson, TERN executive director and former Nongame program manager, narrated the CD. “Calls of the Wild” not only raises awareness of Georgia’s frogs, it helps prep volunteers for projects such as the North American Amphibian Monitoring Program. NAAMP is an international study investigating the distribution and relative abundance of amphibians across the continent. Volunteers monitor local listening routes three times a year. The second monitoring period runs through April 30. To many, “honeysuckle” conjures up images of Japanese honeysuckle, an aggressive non-native plant that was introduced into the U.S. in 1906 and has since wound its way across untold thousands of acres. But before this foreign nemesis arrived, the word honeysuckle had a more positive connotation. 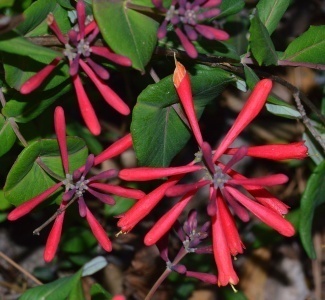 Back then, folks in the Peach State grew up with our native coral honeysuckle. It was, and still is, known as the trumpet honeysuckle and woodbine. Honeysuckle was known then as a thing of beauty, and even revered for its medicinal uses. It’s still revered by some, a stunning plant loved by wildlife and easy to grow. Read Terry’s full column for a close look at the native plant with a name that has fallen into disfavor. 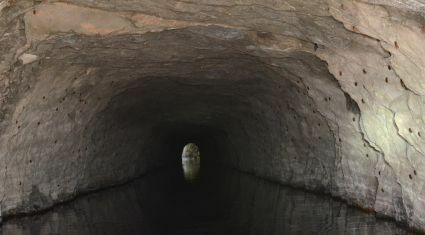 Black Diamond Tunnel, Rabun County – We’re going deeper still. The only sound now is the counters ticking away rhythmically as wildlife biologists Nikki Castleberry and Trina Morris count bats. The ceiling is so low we have to lie down on our backs in the boat. Our helmets nearly skim the ceiling and we are careful not to let the boat’s hull touch the tunnel walls, lest we knock off hibernating bats that would instantly drown in the ice-cold water. We touch our fingertips lightly to the ceiling and silently pull our boat cautiously forward through the small space. Tricolored bats hanging from the ceiling and covered in condensation brush by within an inch or two of our faces. Federal wildlife biologist Pete Pattavina documented DNR surveys this winter for the bat-killing disease called white-nose syndrome, a search ranging from Black Diamond Tunnel, where the bats were healthy, to Sitton’s Cave in Dade County, where they weren’t. Read Pete's full account. White-nose syndrome was confirmed this week in Gilmer County. A tricolored bat from a private mine April 2 tested positive. The mine is the fifth site confirmed with white-nose in Georgia, all this year. DNR has completed winter surveys, and bats are leaving the hibernacula for summer roosts. WNS has also been confirmed in Fern Cave National Wildlife Refuge in Alabama, the U.S. Fish and Wildlife Service said this week. More than 1 million gray bats hibernate in Fern Cave, the largest documented wintering colony of the endangered species. Give wildlife a chance before April 15 by giving through the Georgia Wildlife Conservation Fund checkoff on state income tax forms. Contributions help DNR's Nongame Conservation Section research, restore and conserve the state's rare and other nongame wildlife, native plants and natural habitats, work for which the agency receives no state appropriations. More ways to help. Bald eagle nesting is going strong in Georgia. This year’s surveys by Nongame Program Manager Jim Ozier counted 168 occupied territories, 126 successful nests and 188 young fledged, totals that are up over last year except for a slight drop in eaglets fledged. Report nesting eagles. Have they hatched yet? Tune into DNR’s peregrine falcon nest cam and follow what will very soon be the growing family of a peregrine pair nesting atop Atlanta’s SunTrust Plaza. State & Tribal Wildlife Grants were cut another 5 percent through sequestration. The program critical to helping states keep wildlife off the endangered species list – and taxpayers avoid more costly restoration efforts -- has been cut by 35 percent since 2010, stirring efforts for “robust” funding in fiscal year 2014. Twitter may be all a flutter about DNR’s Youth Birding Competition Saturday and Sunday, April 13-14. Teams in the 24-hour birdathon can share photos and status updates at @GeorgiaWild with the hashtag #YBC2013. Another 1,000 acres of red-cockaded woodpecker habitat is under DNR management. The Army Corps of Engineers formally approved the setup for corps land leased for Lake Seminole Wildlife Management Area and adjacent to Silver Lake WMA’s population of the endangered woodpeckers. The U.S. Fish and Wildlife Service offers these insights into its work with federal and state road agencies regarding the discovery of an endangered Indiana bat in north Georgia. For species not listed but considered at-risk in the southeastern U.S., the Fish and Wildlife Service has put its plans and efforts online.